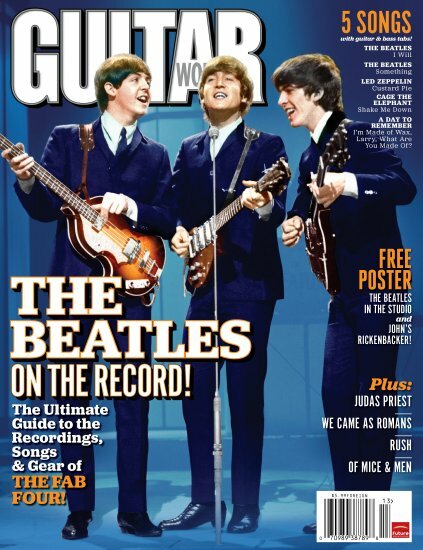 Guitar World magazine in the US has released a special holiday edition that focuses on the Beatles as guitarists. They are calling it their “ultimate guide” to the recordings, songs and gear of the band. The issue is devoted to an in-depth examination of the Beatles 13 albums – from “Please Please Me” to “Let It Be” – and includes commentary culled from original interviews with producer George Martin and engineers Geoff Emerick and Alan Parsons. The magazine explores the Beatles through their musical instruments and the unique recording equipment inside EMI’s Abbey Road studios. According to the press release I was sent by the magazine, each album is explored in detail – from the story behind its creation to the guitars and amps used in its making, for example the George Harrison Rickenbacker 360 12-string guitar used on “A Hard Day’s Night” and numerous other classic-era songs, as well as his custom-made rosewood Fender Telecaster, used during the making of “Let It Be”. There’s also behind the scenes stories of selected tracks from each album including “I Saw Her Standing There,” “Ticket to Ride,” “While My Guitar Gently Weeps,” and others. The Holiday 2011 issue of Guitar World is out now. To find out more visit the magazine’s website. This entry was posted in Abbey Road, Beatles, Beatles Music and tagged Abbey Road, Beatles, Guitar World, Music by beatlesblogger. Bookmark the permalink. If you really want your recording to sound like the Beatles, Sweetwater has a plugin pack and settings pre-configured designed by engineers to replicate their sound. The great thing about the Beatles is that they created timeless classics with a mostly natural sound. They didn’t depend on gizmos for their sound like some modern groups. Their songs will remain popular long after the modern groups have been forgotten. When they did start to experiment with their sounds, they were pioneers.